Three of the world’s largest rivers, the Ganges, the Brahmaputra, and the Meghna, converge in the country of Bangladesh and dump one gigaton of sediment there annually to form the world’s largest delta (The Ganges-Brahmaputra-Meghna Delta, or GBMD). This delta overlies the rapidly subsiding junction of three tectonic plates. Almost 160 million people live in this active geologic setting, making Bangladesh (about the size of Iowa) the world’s most densely populated nation. As a result, events such as floods and earthquakes, for which the region is at great risk, pose a large threat to human life. Currently, however, the interactions of sedimentation and tectonics are not well understood on such a large scale. Additionally, the well preserved stratigraphic record in Bangladesh remains relatively unexplored. Define tectonic plate boundaries that are buried by sedimentation. 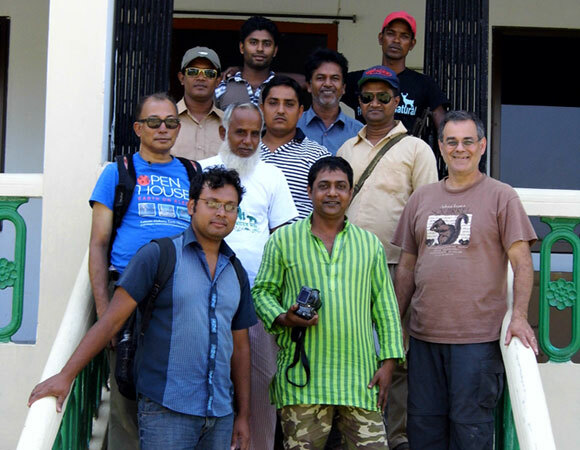 In addition to providing a reliable base of geologic knowledge, the project will create opportunities for graduate and undergraduate students through international field work, collaborative lab experiments, and interdisciplinary courses in Bangladesh. The BanglaPIRE institutions include: LDEO, Vanderbilt University, University of Minnesota, City University of New York, University of Dhaka, Bremen University, Physical Research Lab, India, Instituto Nazionale do Geofisica e Vulcanologia, Italy, and Bengal Engineering and Science University. Figure 1. 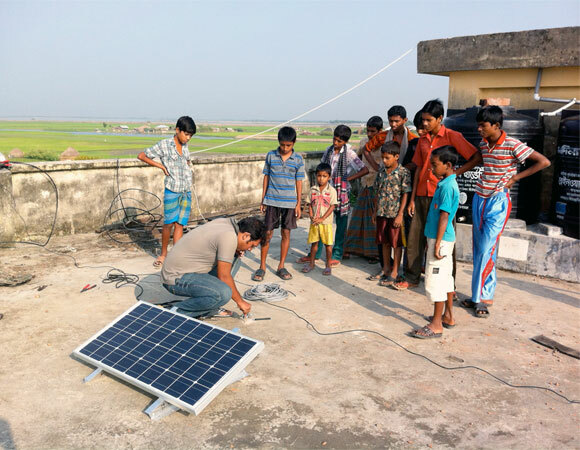 Geologist Fayaz Kabir with the University of Dhaka, works on setting up a solar panel for powering the GPS electronics. 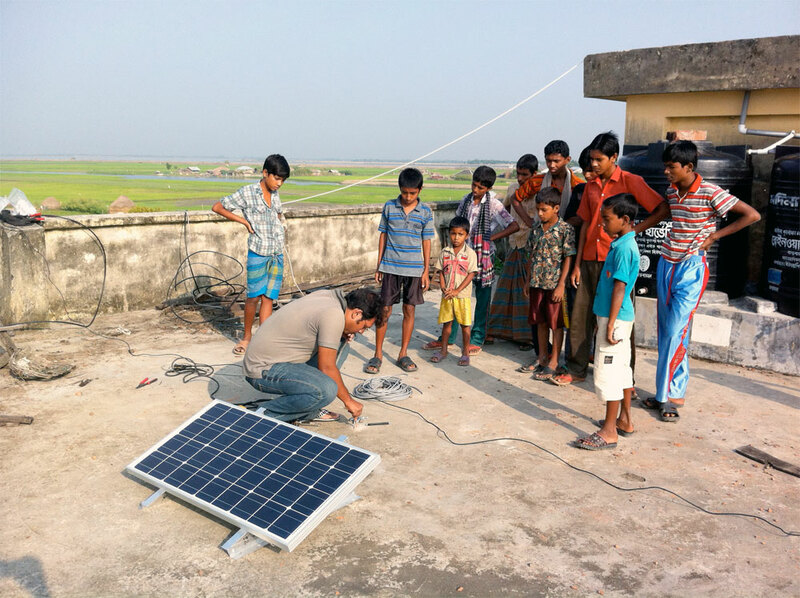 The station was installed at a schoolhouse in the southern islands of Bangladesh. Photo by Sarah Doelger. Figure 2. 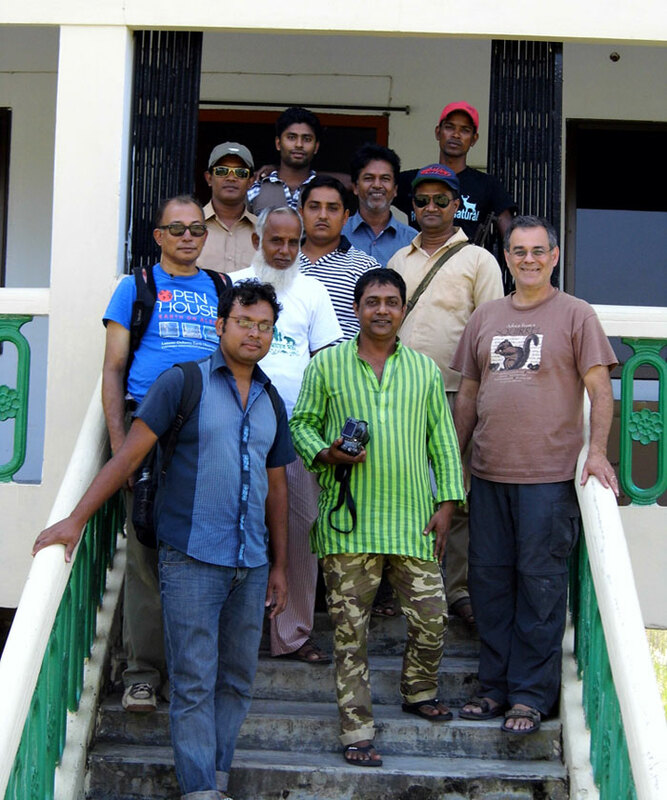 PI Mike Steckler (front, right) stands with Bangladeshi collaborators at the Sundarban World Heritage Site headquarters, where the most southern GPS station was installed. Photo by Sarah Doelger. Figure 3. 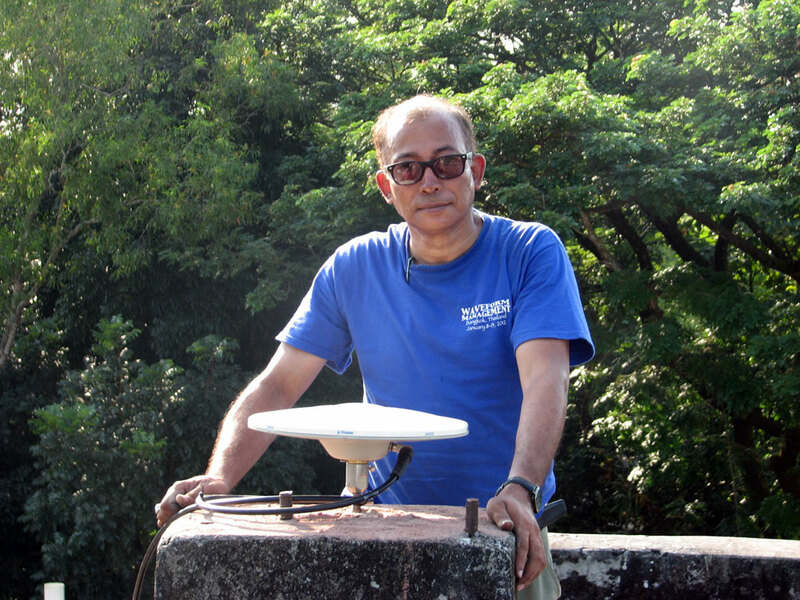 Professor Humayun Akhter of the University of Dhaka stands next to the GPS antenna he installed in the city of Bhurungamari in Northern Bangladesh. Photo by Sarah Doelger. UNAVCO provided technical support to BanglaPIRE for the recent installation of two continuously operating GPS stations. One station was installed in the northern reaches of the country, three and a half miles south of the Indian border and one to the south east of Dhaka, the capital city. In the same field trip, funds from the US Office of Naval Research were used for the installation of three cGPS in the southern coastal region of the country. These stations are a continuation of an existing network installed in Bangladesh with UNAVCO support in 2007. All GPS antenna monuments in the network are single mast-style mounts drilled into the rooftops of reinforced concrete structures. Many of the stations run on solar panels and batteries, and utilize AC power where available. None of the existing GPS stations installed in 2007 is online. Onsite internet connections are rare and even if available, are often slow and unreliable. Many of these stations, including the ones recently installed, are remote and require long hours of travel time to reach, eating up project funds. As a result, four of the new stations were installed with cellular modems to test their viability for data transmission. If cellular connectivity proves to be a reliable means of obtaining data remotely, funding may be sought for the addition of cell modems to other existing stations in the network.